St. Mark's by the Lake, is a parish of the Anglican Diocese of Huron. This means that St. Mark's is part of the Anglican Church of Canada and the worldwide Anglican Communion. The Anglican Communion developed from the Church of England as it expanded throughout the British Empire. Anglicans are active in ministry throughout the world and share 5 common marks of mission, or expressions of that ministry. We proclaim the Good News of the Kingdom. We teach, baptise and nurture new believers. We respond to human need by loving service. We seek to transform unjust structures of society. We strive to safeguard the integrity of creation and sustain and renew the life of the earth. At St. Mark's we endeavour to do all of these things. We also pursue God's truth and love using the tools of scripture, reason, and tradition. We value patience, kindness, and acceptance and we are open to discussion, conversation and questions of all sorts. We encourage faithfulness and generosity in all things. As we do all this, we do it with a sense of humour and fun. I'm not an Anglican, can I come to your Church? All are welcome. Regardless of age, background, religion, gender, ethnicity, all are welcome. Can I attend church with my small children? As stated before, all are welcome. St. Mark's is a family friendly church and we are delighted for your children to remain in church with you or to attend our Sunday School programme. Both are perfectly acceptable options. By attending church. We do not have a formalised membership process. We will welcome you and place you on the parish list at your request. When you are ready you may request offering envelopes to help support the work of the church. Do I need to be baptised to receive communion? Yes. Communion is the means by which we are restored to communion with God, which is a relationship that is established at baptism. Just ask. Approach the rector and ask about being baptised. The rector will be responsible for ensuring that you are appropriately prepared for baptism and the rector will preside at the baptism service when the time comes. Every Anglican parish has their own requirements for weddings. We welcome those who wish to be married at St. Mark's. We require at least 3 months notice prior to a wedding, and at least one of the parties must be a baptized Christian. Marriage preparation is required by the canons (church laws) of the Anglican Church of Canada. 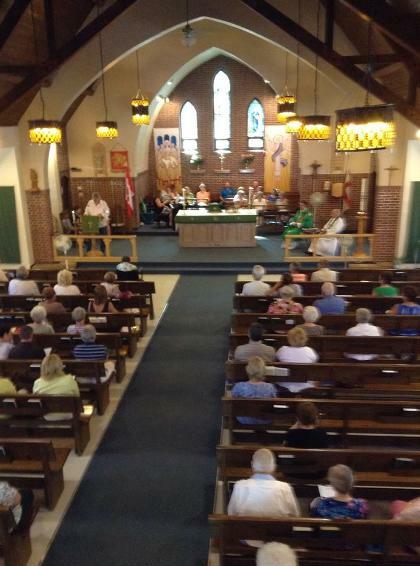 Above: An ordinary summer Sunday at St. Mark's. 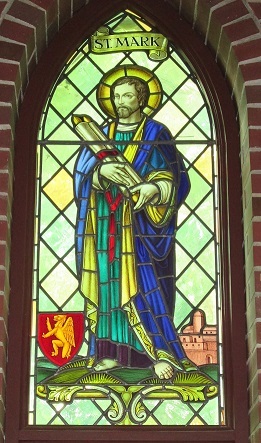 Above: A stained glass representation or St. Mark.